Approximately 130 miles to the southeast of Memphis, in the heart of northeast Mississippi timber land on a two-lane state highway, lies the small town of Smithville. Or perhaps I should use the past tense... no, the good folks of Smithville would strongly disagree. On April 27, 2011, at 3:45 in the afternoon, the world according to Smithville changed forever. For the first time since 1966, an EF-5 tornado struck the state of Mississippi and literally leveled this small town of 882 (2000 Census). According to the National Weather Service in Memphis, peak wind reached 205 mph and the maximum width in the Smithville area was 1/2 mile. The tornado's path started just southwest of Smithville and continued for over 35 miles in northwest Alabama. A total of 17 persons lost their lives in Smithville with an estimated 40 injured. 18 families lost their homes, another 52 had some sort of damage. The post office, police station, and water and sewage systems were destroyed and another 7 businesses, mostly on Highway 25, or Main Street, were severely damaged. The homes that were destroyed were not shacks or dwelt in by lower income residents. They were fairly new (most under 10 years old), well-built, two-story homes that were bolted to their foundations. And many of these homes were literally swept off their foundations by the category 5-force wind. The plumbing in many cases was shredded and appliances went missing. Even a resident's 1965 Chevy parked in front of his destroyed home was never found, probably laying in pieces in the shredded forest nearby. Three months later, on July 22, I had a chance to tour what was left of this small hamlet. I had never observed the damage path of an EF-5 twister and what I saw was devastating, yet hopeful, all at once. I could tell that the spirit of the residents of Smithville lived on, even though literally blocks of houses had been demolished and bulldozed. There were dozens of slabs, some with tile flooring where kitchens and bathrooms once stood, others with scarred linoleum that had been ripped apart by gale-force wind. I recall one remaining pile of debris at the site of the Smithville Baptist Church which contained the remnants of the church organ. Another image that stands out is the former site of the Smithville Post Office, zip code 38870, now just a slab surrounded by a small parking lot and a row of battered post office boxes - the only objects more than about 6" tall that were still standing in that area. But perhaps the most striking scene was a sea of slabs where several lives were lost back-dropped by the Smithville Cemetery, which forfeited its funeral home to the storm and likely gained several more unfortunate souls. Despite the devastation, however, there were signs of hope. Many empty lots and concrete foundations that lived a longer life than the walls and roofs that once completed them were marked with an American flag. One business had hung a handcrafted banner displaying an image of the Mississippi Magnolia that read "Once you choose hope, anything's possible." And alongside an empty side street stood a vibrant and color-filled floral cross that stood as tall as the hopes of the people of Smithville. In place of some businesses, like the downtown bank, there were temporary trailers, set up to maintain commerce. The Fire and Police Departments - heroic first responders in the last few days of April - had re-located and continued to operate, a few new concrete slabs had been poured as rebuilding commenced, and repairs being made to structures that managed to survive. Below you will find a slideshow of some photos I took of the devastation and signs of hope. April 27th will be a day meteorologists across the country will never forget. From my experience working in Mississippi, there seems to be at least one day just about every year during the spring that all the parameters line up to create a recipe for disaster. Last year (2010), it was the day of the Yazoo City tornado. Remembering the death and devastation that it caused, we were all hoping the models were going to be wrong about April 27th and that there would not be a repeat, but God had other plans. There was not just one round of severe storms on April 27th, but three. The first started during the early morning hours between 2:00-5:00 am, storms spawned several tornadoes, including an EF-3 that took at least four lives. The weakest of the three rounds occurred during the mid morning hours, between 9:00-11:00 am, with mostly straight-line wind damage being the result of those storms. The third and final round of storms, including the one that produced the Smithville tornado, started developing along the Mississippi River just before noon. As fast as the storms developed, they almost instantaneously started rotating and became tornadic. The storms were traveling as fast as cars drive on highways, near 60 mph, which made the urgency of making sure people seeked shelter, yet stayed calm, of dire importance. Of note was the number of debris balls on radar that day. Even veteran meteorologists stated how they had never seen so many in their careers. A debris ball is a clear indication that a tornado is on the ground, due to its high reflectivity and its location at the end of a hook echo, likely signifying that large objects are being picked up by strong winds. Tornado warnings were issued well in advance of the storms, with some, including the residents of Smithville, receiving a warning time near 45 minutes. As the storm approached Smithville, it was already producing a tornado that was later rated an EF-3 by the NWS. Just southeast of the town, the storm weakened slightly weakened. NWS survey teams later confirmed that during this time, the tornado briefly lifted before dropping back down again as a stronger EF-5 tornado just outside of Smithville. It became evident on radar that significant damage had occurred in Smithville as the debris ball became increasingly enhanced as it tore through the small town. When the first reports and images started pouring in from the town, my heart sank. One of our anchors who lives in Smithville was on his way to the station when the tornado struck. He turned around and drove back, only to find complete devastation of a town he once knew. He called into the station and gave a first-hand account of the chaos he was seeing, not even an hour after the tornado ravaged the town. The images he described were horrifying to hear, especially as tornado warnings continued across the region. How he maintained his composure while walking through the streets just after an EF-5 tornado tore through, I will never know. Within the hours and days after April 27th, the scope of what had occurred in Smithville and the long road of recovery that lay before residents, became clear. Rescue and recovery efforts continued for several days after the disaster in hopes of finding the missing still alive. Residents who had survived tried to salvage anything that was left from the storm's destruction. Some seemed to walk around almost lost with despair. As the town's landmarks were scraped clean off the earth, it appeared that no building was unscathed by the powerful winds. Despite the horrific tragedy that had occurred, one thing was apparent - the spirit of the people of Smithville was not lost. With an outpouring of help and support from neighbors and people all over the country, residents knew their town was going to prosper again. Amazingly, only four days after the town of Smithville was almost scraped off the map, signs of hope and the strength of the community continued to shine through. That Sunday, following the devastating tornado, residents gathered for prayer at the Smithville Baptist Church like they would any other Sunday. Though this Sunday, instead of sitting inside the church, they were sitting outside under a tent on the concrete slab - all that was left after the tornado. Residents prayed for lost loved ones and the strength and courage to press on. After rescue and recovery missions were completed, the start of clean up and debris removal began. The people of Smithville stayed positive, despite knowing that a long road lay ahead. A symbol of hope from the beginning was the Mayor of Smithville himself, Gregg Kennedy, a life-long resident of the town who remained strong for his community in the eyes of despair. A humble man, he watched firsthand as his hometown was almost completely destroyed. Though obviously heartborken, he never once showed it during any of the press conferences or interviews he was asked to do. He had faith in the town and its people and knew they would return and have a stronger community than before the storm. Now, over three months after the horrible disaster, the debris is almost gone with rebuilding continuing to occur. The town still has a long way to go, but as each day goes by, it gets stronger and closer to what it once was. Finally, this video was shot on my tour of the town. I hope it provides some sense of both the loss incurred and the hope that lives on. The music track I chose seemed appropriate, MercyMe's 2007 hit "Bring the Rain." A special thanks to WTVA's Jennifer Watson for her candid commentary. It is greatly appreciated. Your comments on this post are welcomed below. The Memphis/Shelby County Emergency Operations Center Staff has been approved to receive the prestigious NOAA StormReady Community Hero Award for their life saving actions during the historic 2011 Lower Mississippi River Flood. This is the first time the NWS's national advisory board has approved the receipt of this award since 2006, and only the fifth time it has been approved since the award's inception about ten years ago! A recognition ceremony is in its planning stages. Congratulations to the Memphis/Shelby County EOC! In an interesting twist, the fourth recipient of the Community Hero Award is also a Mid-Southerner. Caruthersville, MO Fire Chief Charlie Jones received the award when his actions saved countless lives as an EF-3 tornado bore down on his town in April 2006. For more on the actions of Charlie Jones, visit this page. For more on the StormReady program, follow this link. Counties deemed StormReady in the metro area include Shelby, Tipton, Fayette, Crittenden, DeSoto, and Tunica, as well as the City of Senatobia. In addition, the University of Memphis and FedExForum are also both designated as StormReady. A strong tropical wave, which later this afternoon could become Tropical Depression 4 or Tropical Storm Don, is beginning to swirl just off the coast of the Yucatan Peninsula of Mexico, near Cancun. The graphic below shows the computer model forecasts for potential tracks of the storm. 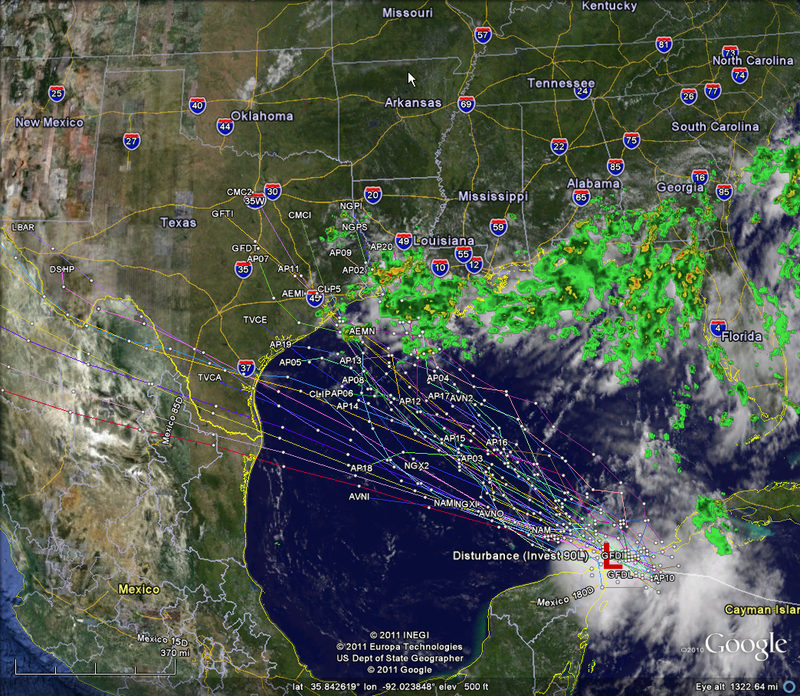 As you can see, it appears that Texas could be the recipient of Don's much-needed rainfall. Texas would be a good place for Don as the graphics below show. The south-central U.S. is VERY dry, with soil moisture over 100 mm (4 in) below normal and an "exceptional drought" in place across much of the region. A land-falling tropical system is about the only phenomena that can provide some significant relief at this point. As a reminder, it's been 3 years (Ike in 2008) since the United States experienced a land-falling hurricane and 6 years since the last major hurricane to make landfall (the infamous 2005 season). While what will become Don may reach hurricane status, it is too hard to determine at this time if that will occur. In any case, the people of Texas must be anxiously watching the Gulf for some welcome drought relief! It is also to soon to say what, if any, effects this system may have on Mid-South weather. Stay tuned to MemphisWeather.net for possible impacts as we near the weekend. Most everyone that watches a TV weathercast or follows the weather at all will hear often that the "normal high for the date is" or the "average low for today is..." Have you ever wondered how those "normals" or "averages" are figured? You can find revised climate pages for Memphis International Airport under Climate Data on MemphisWeather.net, then click "Normals & Records." The normal highs and lows for 1981-2010, as well as the daily records have been combined into one table for each month of the year. So what changes are there from the 1971-2000 period to the 1981-2010 period? Temperatures were, on average, slightly higher overall. The biggest differences came in overnight lows, which rise a little more (generally speaking) than afternoon highs. The average temperature for the year rose from 62.7 degrees to 63.1 degrees, or just under a half degree. This is because the 1970s were discarded and the 2000s added, and the 21st century has so far been generally warmer than the 1970s. The month of August was almost 1 degree warmer in the new data set, while the months of July and December were just slightly cooler. What do you think? Do you have any anecdotal evidence to support the Memphis area getting overall warmer and drier? Remember that one storm (or even one season) does not make a trend! The Mid-South has already experienced a couple of heat waves this summer and now we are headed into yet another. The past several days have been "seasonally warm" with highs in the lower 90s and modest humidity. However, the high-profile heat wave that is gripping the Midwest is seeping into the Mid-South from the north as massive high pressure shifts slowly east, while also weakening ever so slightly. Over the next several days, we will be seeing our high temperatures rise about a degree a day, while humidity values (as represented by the dewpoint) also rise accordingly. This will bring about another round of Heat Advisories and possible Heat Warnings beginning Wednesday. High temperatures will range from 97-100 through the end of the week and likely into the weekend, while low temperatures in the city will have a hard time dropping below 80 (mid to upper 70s in the suburbs). Coupled with dewpoints in the lower to mid 70s, heat index values will climb to 105, with some areas north of the city possibly reaching 110. Once again, please review our Heat Safety Tips (click here or on the tab above) and be prepared to spend more time indoors. With the heat, you can also expect ozone levels to be elevated, possibly into Code Orange territory this week. Chances of rain in the metro area are nil through Thursday, then isolated storms are possible in the afternoon and evening hours on this weekend and slightly better chances early next week as high pressure subsides and the extreme heat subsides. The Memphis FOX affiliate, WHBQ-TV FOX 13, will be putting on the first ever "Mid-South Weather Camp for Kids" on Saturday, August 6, 2011, from 9am to noon. Geared towards 2nd - 6th graders who are either fascinated or scared by the weather (and their parents or chaperones), Weather Authority Chief Meteorologist Joey Sulipeck will host the event at Agricenter International. Pre-registration is strongly recommended in order for sponsors and participants to plan on how many kids will turn out and all children must be accompanied by an adult for the duration of the event. Besides getting to meet the personalities from FOX 13's Weather Authority, children will have the opportunity to learn more about weather via hands-on activities and interactive exhibits. Other exhibitors include the National Weather Service, FedEx Meteorology Department, Shelby County Health Department, Shelby County Office of Preparedness, and Agricenter International. There will be door prizes, free giveaways, and much more! So, if you have kids between 2nd-6th grade who would enjoy a FUN (and educational) experience as school gets ready to start for the year, register them now for the FOX 13 Weather Camp! Yours truly will also be present representing the local chapter of the American Meteorological Society/National Weather Association, as well as FedEx. Click here to register or get more information! A very warm week is ending with the passage of a front (I refuse to call it a cold front). Ahead of that front, a complex of thunderstorms passed through the region in the early morning hours today. At Cirrus Weather Solutions in Bartlett, we recorded just over an inch of rain in about 2 1/2 hours. It was much-needed, and though a Severe Thunderstorm Watch was in effect at the time it passed through, no severe weather was reported anywhere in the area. The front will dissipate to our south before cooler or drier air can make it into the region. As high pressure builds back in, both at the surface and aloft, we'll be left with high humidity and hot temperatures. June's average temperature of 83.7 degrees was the 4th warmest June on record in Memphis (following the 2nd warmest June last year), but we didn't have a stretch of heat AND humidity like we are about to enter into for at least the first half of next week. MWN is predicting 4-5 days of high temperatures near 100 and dewpoints in the lower to mid 70s. This combination of heat and humidity could push heat indices well into the danger category, topping out near 110 or higher to start the week. In fact, a Heat Advisory has just been issued by the NWS for this weekend for the entire metro area except Tipton County, and the statement mentions the possibility of an Excessive Heat Warning for early next week. 1. Stay indoors as much as possible (ozone levels will also be elevated, which could create problems for those with lung conditions or difficulty breathing). 2. If outdoors, drink plenty of water or other non-alcoholic, non-carbonated beverages. 3. Wear loose-fitting, light-colored clothing. 4. Listen to your body and do not over-exert yourself. Heat exhasution and heat stroke can come on quickly. 5. Try and accomplish outdoor tasks in the early morning or late evening hours. 6. Keep a watchful eye on the very young, elderly, and pets. Be sure outdoor pets have plenty of fresh, cool water. 7. NEVER leave any living thing (people or animals) in a vehicle without a properly running air conditioner, even for a short period of time. MWN will keep you updated on this potentially serious weather situation. Check out the MWN Forecast for full details on what to expect. Early this afternoon, an outflow boundary, or gust front, that was produced by storms very early this morning over southeast Missouri and northeast Arkansas, is moving through the metro area. 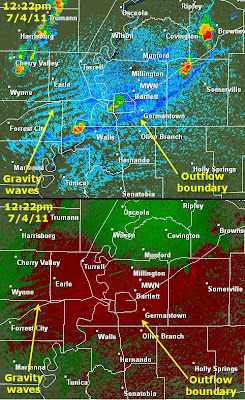 Trailing this outflow is a set of gravity waves. I posted a pair of radar images (reproduced below) on Facebook and Twitter that clearly show the waves. So what is a gravity wave? A gravity wave is really nothing more than a wave moving through a stable layer of the atmosphere. If you think of a rock being thrown into a pond, you know ripples migrate from the point the rock hits the water outward. An up and down motion is created as these "waves" spread out. The strongest waves are near where the rock hit the water and they get smaller as they spread out. In atmospheric terms, something causes the air to lift - in this case, thunderstorm updrafts. In unstable air, that air continues to lift. However, if the lift occurs into an area of stable air, the tendency will be for the air to sink back downward. The first wave is created. As the now-downward moving air sinks past it's point of equilibrium (where the air will neither rise nor fall), it begins to rise again. The air is attempting to achieve a balance in the vertical. Thus, gravity waves are born. The video below is an excellent example of how these waves "look" when the stable layer includes enough moisture to produce a cloud layer. Watch the clouds undulate as they roll past the fixed camera. Truly amazing! The converging and diverging air associated with gravity waves is easily picked up by Doppler radar if they are strong enough and close enough to the surface. Based on radar interpretation of this morning's waves, they existed between about 1,000-5,000 feet above the ground. The base of the clouds created by these waves was about 4,000 feet, according to observations from Memphis International Airport. The rising air that created the clouds also initiated thunderstorms. So, this is exactly what happened this morning. Thunderstorms to our north sent out gravity waves in a stable layer that propagated into the metro region. Here, they encountered a more potent atmosphere - an unstable, moist, and warm one. The waves produce areas of converging air, which many times in a summertime atmosphere is the trigger needed to produce thunderstorms. Thunderstorms producing additional thunderstorms - hundreds of miles downstream and hours later! TheWeatherPrediction.com by Meteorologist Jeff Haby of Mississippi State Univ. 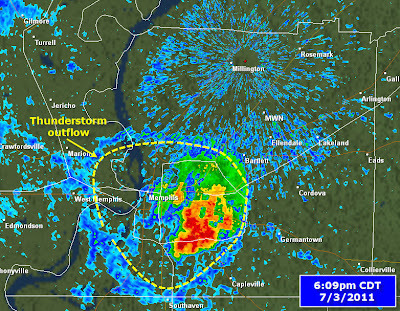 MWN StormView Radar is now showing the storm to have completely dissipated. The airport reported a wind gust to 38 mph from the north as the outflow from the storms crossed over, though no rain was recorded. The temperature dropped to 88 degrees. No further rain is expected this evening for those expecting to see fireworks downtown or perhaps in your driveway! As of 6:15pm, a lone thunderstorm has popped up in the heart of Memphis, inside the I-240 loop, in the past hour and is moving very little. An Urban Flood Advisory was issued as some areas directly under the storm could see 1-2" of rain. It also caused a 35 minute rain delay at AutoZone Park for tonight's Memphis Redbirds game, but the game will be played and fireworks will follow. Below is a screenshot of the storm taken about 6:10pm. 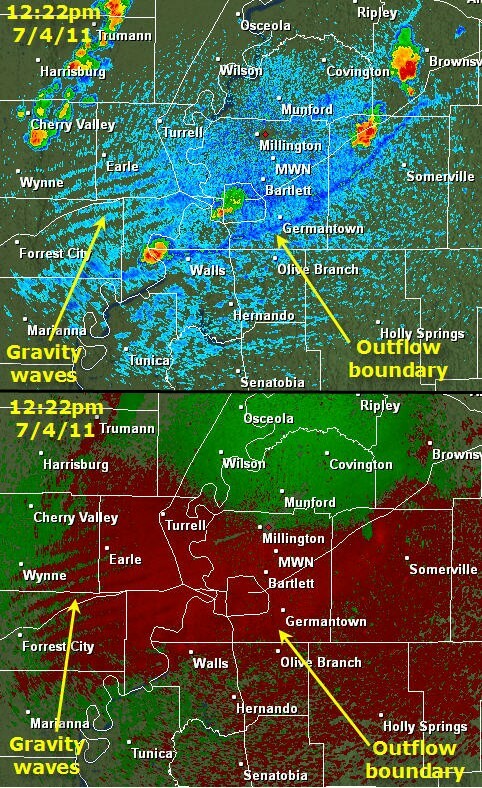 You'll notice the typical summertime "outflow" emanating away from the storm. This is due to wind rushing downward inside the storm, hitting the ground and spreading out in all directions. Commonly, this is called a microburst and it can produce strong straight-line wind. 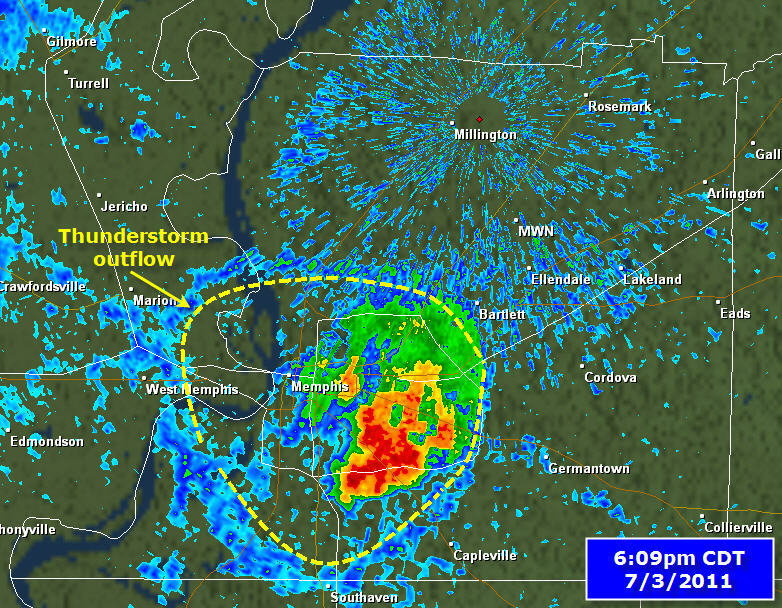 The outflow could also spark additional shower development, though so far it has not done that. MWN will continue to monitor and update everyone via Twitter and Facebook this evening. Play ball! With spring marked by several bouts of severe weather, heavy rain, and high wind, the meteorological start of June brought unrelenting heat and a couple more thunderstorm complexes with high wind, hail, and lightning. The heat would be the story of the month though as 26 of 30 days in June reached highs of 90 degrees plus, nearly double the long-term average of 14. Even the 4 "cooler" days reached at least 84. In fact, the average high and low temperatures for the entire month (93/74, respectively) were exactly what we typically expect during the hottest days in July. Several record temperatures were set or tied during the month, including record highs of 99 degrees on the 3rd, 4th, and 5th and 98 degrees on the 7th. An 80 degree low temperature on the 19th tied the previous high minimum for the date, set just last year (2010). The average June temperature was 83.7 degrees, which was 5.0 degrees above normal. The average high temperature was 93.3 degrees (14 degrees above May's average high) and the average low was 74.1. The coolest temperature of the month was 67 degrees on the 14th and the highest temperature was 99 degrees on the 3rd, 4th, and 5th. The average related humidity was 63%. Precipitation for the month of June totaled 3.55", which was 0.75" below average and half of what was received in May. There were only 6 days with measurable rainfall, though 3 of those measured more than one-half inch. The greatest 24-hour total was 1.20" on the 11th. The peak wind gust was 72 mph in a severe thunderstorm on the 16th with an average wind speed for the month of 7.8 mph. Click here for a daily statistical recap for Memphis International Airport. 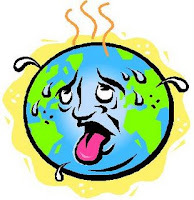 The average temperature for June at Cirrus Weather Solutions in north Bartlett was 82.0 degrees with a maximum of 98.7 degrees on the 4th and a minimum of 64.5 degrees on the 16th. June precipitation ended below normal with a total of 3.59". A co-located manual gauge used for the CoCoRaHS program measured 3.75". The peak wind gust was 39 mph on the 11th. Average relative humidity was a high 68%. Click here for a daily recap on MemphisWeather.net. For the month of June, the average temperature error in all MWN temperature forecasts was 1.78 degrees, lower than all compared computer models, including the National Weather Service, by almost 10%. Nearly 78% of the MWN temperature forecasts for the month were within 2 degrees of the actual temperature. MWN's forecasts extend out five periods (or 2.5 days). For dewpoint accuracy, the MWN forecast beat all data sources, averaging 2.03 degrees error and falling within 2 degrees of the actual dewpoint nearly three-fourths of the time. Historical accuracy statistics can be found here. An opportunity to see some great fireworks and meet yours truly! 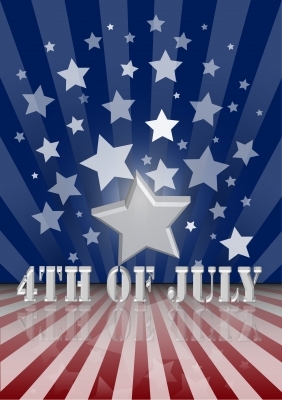 Do you have big plans for the Independence Day weekend? I can just about guarantee that you won't be rained out! However, it will be hot. Highs will reach the upper 90s this afternoon, Sunday, and Monday and humidity levels will rise a little each day. Look for heat index values between 100-104 each afternoon. Wear plenty of sunscreen and re-apply after a few hours if you will be out very long. Also, there is a Code Orange ozone alert in effect today, which I expect might continue Sunday and possibly Monday. This will make it difficult for those with asthma and other breathing conditions to be outside for long. The full 8-day forecast can be found here. MemphisWeather.net will be out and about tonight, so if you want to meet me (Erik), come to the Flag City Freedom Celebration in Millington. I'll be "on duty" as the official weather observer for the event, measuring any rain that falls (though I might as well leave the gauge at the office)! If you spot me, introduce yourself! I'll have free downloads of the MWN iPhone app with me just for the asking! If you're not sure who to look for, check out this blog post. I'll have on the white MWN polo and the MWN rain gauge will be on the dock at the lakehouse, by the VIP viewing area. But it's not just about me right? The event is well-done and the fireworks are phenomenal over Navy Lake! Stay cool this weekend, have a safe 4th, and MANY THANKS to all active duty military and veterans who allow my family to celebrate the freedoms we enjoy! God bless you!